The Liftkar PT UNI (Universal) stairclimber is a roll-on/roll-off ferry for any make and model of self-propelled wheelchair or transport wheelchair and it can cope both with normal and with winding stairways. 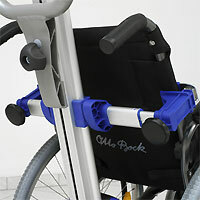 The integral backrest restraint holds the wheelchair securely in place while you are in transit. The Liftkar PT UNI stairclimber is available in two models: UNI 130 and UNI 160, denoting their load capacities in kilograms for the wheelchairs plus the passenger. 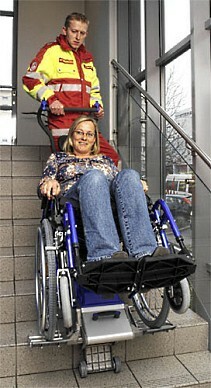 It is easy to handle and there is no need to remove the wheels on the wheelchairs. Just reverse the wheelchair onto the platforms. The size of the back-wheels can vary a lot. While in transport, the handle holds the wheelchair safely and securely in place. The integral handle can be adjusted both in heigh and in width. The platforms hinge upwards thus saving space when manipulating without a wheelchair.